Projectile Motion Project, Final Chapter: NASA, hire these 9th graders now! There’s a projectile launched at an initial height of 20 feet with an initial velocity of 50 ft/sec. We want it to land 70 feet away. Under normal gravity and with no wind resistance, what angle is necessary? Our final goal is to create an equation where you can input any target, any velocity, and any height, and find the angle necessary to hit the target. 1. 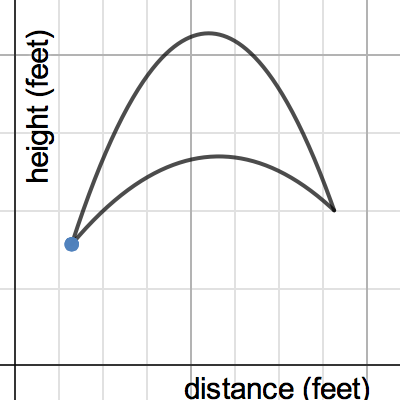 A Desmos graph that asks you to choose any launch point, any landing point and any initial launch velocity, and it will show you the exact possible path(s) of your projectile. 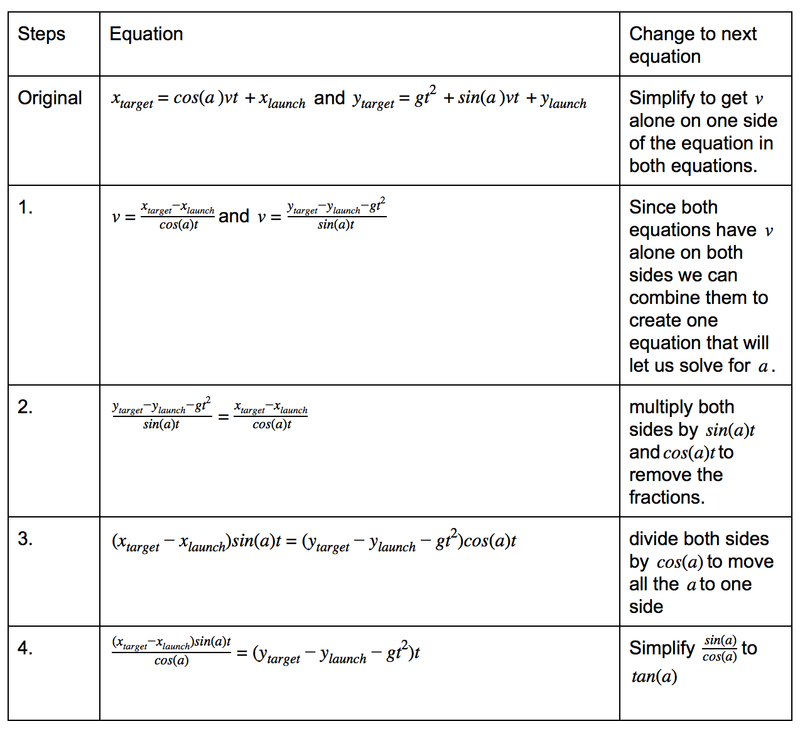 Oh, and you can press play and see a simulation that uses a parametric equation. 2. 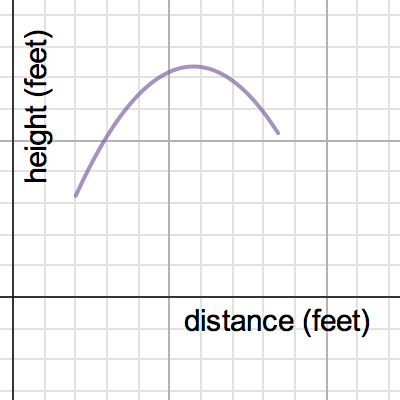 A Desmos graph, taking the same inputs as above, that will tell you the angles of launch required to meet your exact criteria (complete with a step-by-step explanation of the formula’s derivation, added at the bottom of this post). 3. 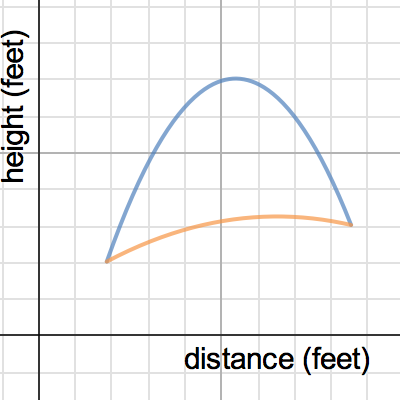 A Desmos graph that asks you to choose any launch point, any landing point and the desired time you’d like the projectile to be in flight. 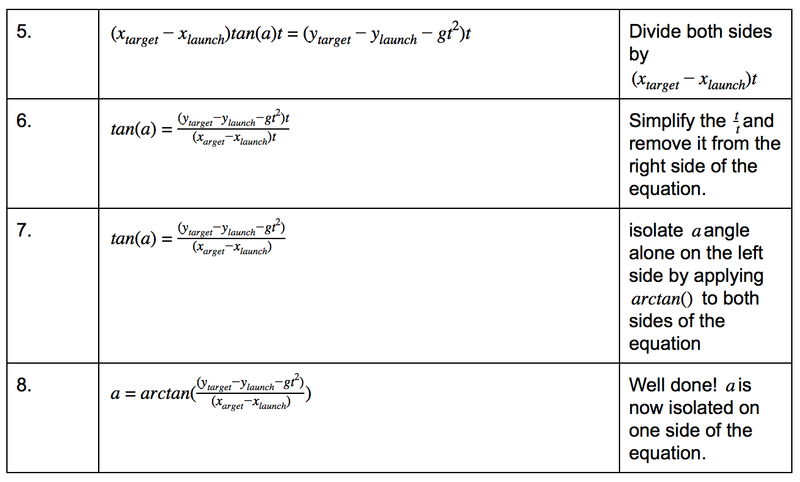 It will tell you the launch angle and initial velocity necessary to meet the criteria, and show you the flight path. A teacher that let them go way off-script (on a project that was supposed to be about quadratics), occasionally weighed in and occasionally pointed them in the right direction. It may be a while before I get students capable of this kind of work again, but most of the bullet points above are within my control. I plan on spending the foreseeable future trying to make a perfect storm like this happen again. So sorry for the delay. I just watched your video in full and I’m truly delighted that you would take my post and make something so cool out of it. What you came up with is really exceptional and I will pass it along to my students, many of whom love coding. I’ve never touched Visual Python, but your video definitely served as a wake-up call. I need to get on that! Thanks again for reading and making the video.